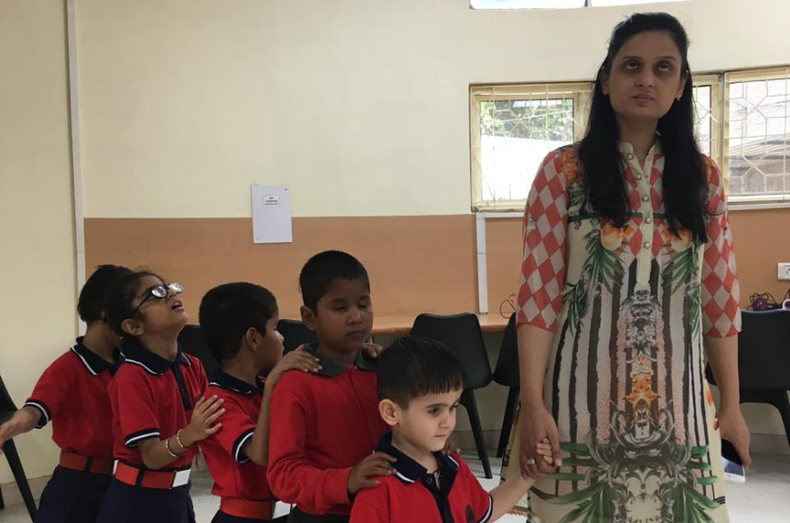 This Raksha Bandhan, in my little capacity as a journalist, I decided to take on something which would help visually impaired children in the long run. Some 100 plus people joined in through word of mouth. And that's when I meet Meenakshi Chandwani from the National Association for Blind, New Delhi. In medical language, Meenakshi is a person with very low eyesight. When I saw Meenakshi, she was literally fluttering like a Butterfly with rainbow wings spreading cheer song tiny tots. So much so that I defied to believe that she had low vision! What we are here is to know how she has made her so-called disability her strength and is transforming lives of hundreds of children who are educated free of cost at the NAB, Delhi. This despite the fact that she was born with a low vision, but was reduced to low vision due to macular degeneration in 1989. Then what happened that changed her from a child who was looked down with pity? What changed her to a woman of power? I threw some direct question at her...Let's read her inspiring life story. I passed 12th grade in 1998, completed a Diploma in Nursery Teacher Training (NTT) in 2000 from South Delhi Polytechnic for Women. You write this in such an easy flow, but I am sure this wasn't as easy as you project it to be. Ah Mahima, nothing is easy, not even for a so-called normal person. It is how we look at life. Yes, there was a lack of structured support for visually impaired in terms of digital books, resources, readers or writers/ scribes. I had to depend on my limited vision to study and hence was always a below average student academically with very few friends in class. Hence, after completion of school, I couldn’t complete my graduation due to lack of awareness about the available associated support and infrastructure for students like myself, at the University level. Also, I couldn’t be involved in school excursions or educational trips because of my limited vision and the lack of systemic understanding of how the school could support a child with special needs. And due to this, my education had to take a pause. Oh, then what next? This must have been shattering. My family tried their best to extend whatever support they could, to continue my formal education was in a public school. However, due to lack of awareness of the tools to enable my studies and simplify the process, they did not want to put additional pressure of expectations on the academic excellence front. In a way, due to the legacy education system and lack of guidance, I limited my own growth and didn’t exploit my potential to its fullest. Yes, I may be a role model for anyone now, but I do accept that due to circumstance, I did backstop in life. But then came my choice to join NTT. It had little to do with my interest and more to do with the fact that it was an easier and faster way for me to become ‘independent’ since the traditional University had limited options for students like me with special needs. The more challenges life threw at me, the more determined I became to help transform other lives that were struggling for wings like me! I had to win over my challenges to help them win. So what was your next move in this direction? I learned about NAB when I decided to study Braille in 2016, as I thought that was the only language which could help me access information apart from the conventional ways of reading and writing. This need came from my deep seeded desire of completing a graduate degree, which I could not in my formative years. It was at NAB, that I received valuable counseling to undergo digital training for visually impaired via speech-enabled software, instead of Braille. They explained to me how this would be far more valuable, me being a visually impaired and not completely blind. I completed the 4 months course in 2016, which opened countless opportunities and a world of knowledge for me. Post completion of the course, I enrolled myself for a BA Program from the School of Open Learning and simultaneously started working with an NGO specializing in providing aid to the specially abled. That's wonderful! But then why NAB? You have a low vision? You are not totally visually challenged? This is where I gained my freedom and discovered the joy of learning. Moreover, to join them in the admin wing meant that I wanted to give back to the community in whichever way I can because visually impaired don’t necessarily need to be led by able-bodied all the time. This can be a start point to building an inclusive society where specially abled can attain complete independence in the true sense. As some wise men say that visually impaired may not have sight, but they sure have the vision to take them places. Moreover, NAB is a place that helps open a world of information and technology-enabled aids, which a lot of us including myself, had no access to before coming here, despite having all the material means to support my aspirations. Aspirations to becoming an inspiration - what's your take on life? I have looked up to my mom who despite of neither being traditionally well qualified, nor socially extroverted or outgoing, always gave us the wings to think beyond our limitations and hurdles that we faced in our day to day lives. She taught us to be truly open-minded about our capabilities and provided unshakable support through the toughest of situations. Yet she always kept us grounded to our core values of keeping family first and being humble. We forget that at home one woman, the mother EMPOWER all, we forget that a woman is the source of power behind who we are. I did not forget this. I knew being a woman, I had to emulate the same strength. And I believe that's what made a difference along with my hope to one day transform other lives. Given a day as a lawmaker, what three changes would you like to bring in the system to make life better for the disabled in general? Job reservation isn't a solution for the visually challenged. Work towards inclusion must start at the grass-root level where writers/ scribes shouldn’t be used as a support system for a visually impaired to render their day to day activities. Technology should enable the system to be completely accessible to all via digital books and resources, designing question papers which are friendly for visually impaired to attempt themselves rather than depend on the traditional reading approach with the help of a scribe. A lot more thought needs to go into the way we teach in schools to integrate students with special needs into the mainstream. At a state and national level, we must take up the task of setting up infrastructure which enables and helps specially abled become increasingly independent at public places. Areas like airport, shopping malls, and tourist attractions must be built in a way that they are conducive and accessible by people with special needs, rather than them being assisted or escorted at all times. Disability has no gender, caste or race. I was once in a flight where at the time of security announcements, I was handed over braille literature by the assistant to read. They had little understanding of the differences between a person with low vision and a completely blind person. Unfortunately, most people today don’t understand this distinction. This incident shook me up and compelled me to reach out to NAB. However, traits such as resilience, compassion and my eagerness to learn, some of which can be attributed to my gender, have brought me this far from where I don’t wish to look back. I want to learn as much and as fast as I can and give back to the system while I take from it. It is also fulfilling to be viewed as a mentor by the children at NAB and my ex-students, who view my story as an example to go after, providing them a sense of direction and the many possibilities that lie out there. This fuels the passion inside in me to keep going. It is important to make people understand that disability is not a disease and also, never a choice that somebody makes. Schools must inculcate awareness at an early age amongst kids to view their specially abled classmates as equals and learn how to include them in all that they do, rather than running away from their issues. It is this empathy when instilled at an early age, will help create a systemic change in attitude towards how ‘disability’ is perceived. This empathy also helps make better parents. This empathy will also drive authorities to build infrastructure which doesn’t turn a blind eye to how people with special needs go about their day in public areas. We need a change in mindset at all levels, and creating a quota alone in schools is not the solution. It is said that beauty lies in the eyes of the beholder and I find my life extremely beautiful, hence I would love to be born as myself always. I have a strong belief that God shows me the good in things much more than the bad, hence the happiness always remains. Since only a content soul can spread happiness, so I would not exchange my ‘full’ life for anything. Don’t look at the path concentrate on the destination; it’s beautiful and we just have one life to reach there. Get set and go.